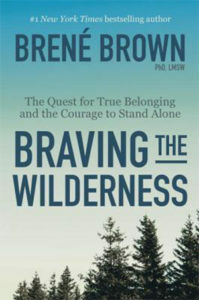 Brene Brown’s Braving the Wilderness takes a look at true belonging, and what it means in our current social and cultural landscape. Brown touches on the level of vulnerability this requires, as you may find yourself alone in your beliefs, even when you are surrounded by people. Brown also points out that fitting in is not the same as belonging, and it is only when you are being true to who you are will you actually feel like you belong. Our conversation touched on the whether our company has a culture of fitting in or a culture of true belonging. We believe in the value of true belonging, as our company aims to create a world in which everyone thrives. If you cannot fully be yourself, you will struggle to thrive. We discussed instances when we as professionals stood “in the wilderness,” what that looked and felt like for us as individuals and as a company, and what we can learn from those experiences. We also took a look at how Brown presents data, and what we, as scientists and communicators, can learn from her storytelling. Braving the Wilderness helped remind us of how we can recognize, respect, and cheer vulnerability in each other. This is particularly crucial for us in how we relate to ourselves, to each other, to customers, and to would-be customers.